When I first moved to the West coast of North America, many people asked me typical questions as to how I liked the contrast between living in a metropolis and a small town amidst the Rocky Mountains. One question always startled me, "Have you seen an inversion yet?" What in the world as an inversion? No one wants to appear ignorant, especially not a lady spoiled (slightly!) by a PhD, so I always mumbled something vague and, quite possibly, academic. When I figured out what it was--with the help of a search engine--I realized that I have seen partial ones, but never the full-fledged phenomenon. 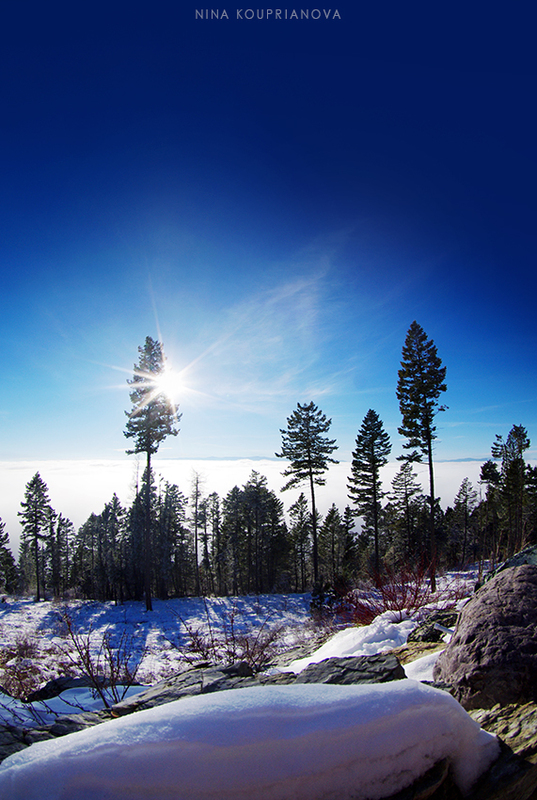 An inversion is an uncharacteristic increase of temperature with altitude, in which a warm air mass above moves over a cooler one below. What this scenario sometimes looks like is having the clouds sit below the peaks. Occasionally, inversions create mirages distorting the way objects appear at the horizon line. I've photographed these images over the span of approximately two hours, so that you could observe the changes that occurred: from two strictly defined "layers" of clouds below and sunshine above to having these boundaries blurred by insurgent fog, making the color palette duller.